I admit, Metal Head is the toughest boss in the game, Gnasty is second, Jacques third, Blowhard fourth, Toasty fifth, and Shemp sixth. Toasty: Pretty Easy to me. Dr. Shemp: A little hard, but not much of a challenge. Blowhard: same as Dr. Shemp. Metal Head: pretty hard, took me a while to figure out how to defeat him. Gnasty Gnorc: Very hard to defeat, Took me almost forever to catch up to him. One thing in common: All are very fun to toast their butts. kaos vs gnasty gnorc would be cool. To me the hardest boss in the game is Jacques. 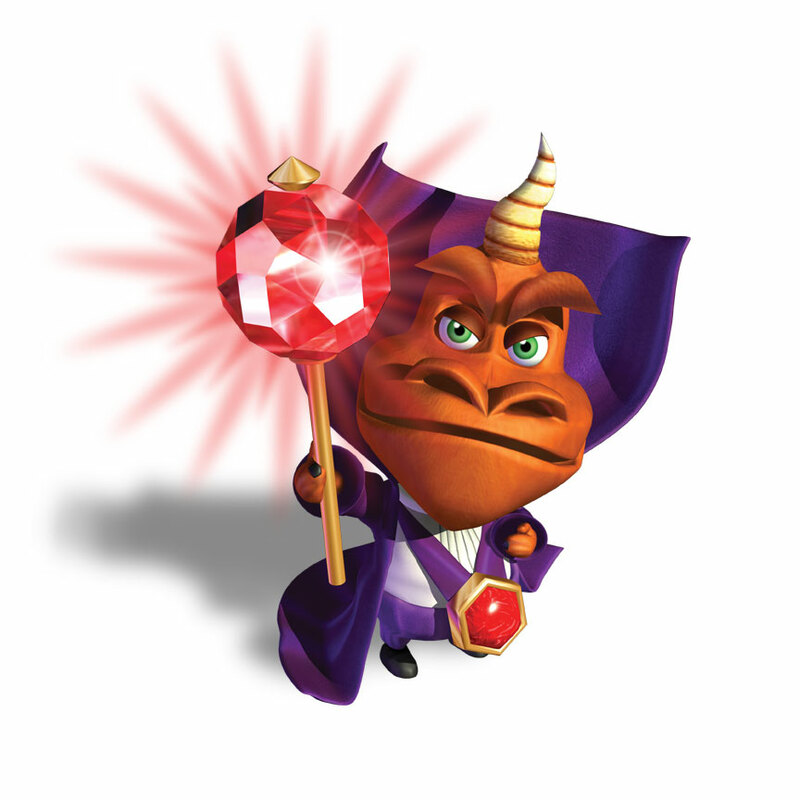 I think he's probably the freakiest villain in the Spyro franchise. i could NOT beat this game when I was younger all because of gnasty gnorc. it wasn't untill five years later that I beat him!!!!! I used to have such a tough time beating Shemp. I never realize you had to jump on the last part of the battle. Whoops. was blowhard wearing a hat? weird huh? probably the strangest boss of the game. i think metalhead has a weird hairdo as well. why do they give the bosses such strange characteristics. if you stand between metalhead and the poles he throws those enemies into the poles killing himself. all jacques seems to do is run away. i couldnt even tell if i was hitting him because he never gave any gems when i flamed him. It's quite funny to chase Gnasty. He acts so tough but runs away from you. I found chasing Gnasty very difficult. I kept falling off the trails or missing jumps. It got really annoying to start all the way back at chasing the theives and repeat the process all over again. Still, it made me feel even better when I finally beat him though. @PsychoBlaster He's not really a boss.You make no contact with him and he's invincible (with out the poles).